A project consists of a change to an organization, whether it means getting to a new market, launching a new product or replacing a computer system, it can be summarized as the complex set of coordinated actions which lead from a starting state “A” one arrival state “B”. When planning a project, the timeline is defined and the cost is agreed upon. This will establish the framework in which to operate. Here are some examples: which product or product line to launch initially on a new sales channel, which geographical regions to prioritize in a new market, or even which functionality of a computer system to implement and which not. These choices are made in order to maximize the benefits and the chances of success for the project, considering that time and resources are limited. 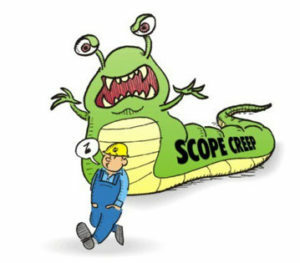 Possible enlargement of scope and benefits of the project (e.g. : product, geography, function, …) are left to further future actions (projects or day-to-day). Adequate resources are allocated to the project, based on the targeted objectives. Then a project plan is developed and run. Once a project starts, during its execution it is inevitable that people within the company structure see the opportunity of increasing the benefits or notice omissions in the initial scope of the project. Requests will arise. These, if not properly managed, will lead to “scope creep”, i.e. the scope slowly grows in an unmanaged manner. This is the biggest risk for the results of a project. If the project manager starts accepting such requests, it is very likely for the project to derail and to be transformed into a complication monster, not to be managed within the planned time and cost. In short, a disaster is in the making. The scope of the project must be well defined and shared with all stakeholders from the outset, during the preliminary analysis phase(s). New requests, arising while the project is running, should be rejected by the project manager in all cases except those listed in point 3. Requests from higher hierarchical levels in the organization and design changes that appear absolutely necessary for the success should be decided upon (along with any budget and timing changes) by the same people who assigned to the project the resources and approved the initial plan. Normally, this is the steering committee. The first rule for the success of a project is that you do not change the purpose during project execution. This must be clear not only to the project manager but also to his/her boss(es) and to the other stakeholders. This said, changes may take place, but only following the correct formal steps, reviewing the project budget based on changes and approving it at all necessary corporate levels.